Earlier in March I taught a workshop for my dear friend Sue Craig and the students on her “Grow Your Own Colour” course at Plumpton College Brighton. Although I no longer lead workshops myself because of my physical limitations, I am always happy to work with Sue and her students because Sue provides all the materials and equipment and prepares everything in advance and she and her students do everything that is required as far as the hard physical work is concerned. I just sit and talk a lot and give the orders, which suits me very well! This course was “Marvellous Madder”, which showcases the remarkable colour properties of this amazing dye plant. Last time I did this workshop I attempted too much and rather over-worked the students, so we decided to limit it to 26 wool samples this time. Use about 80% madder and wash the madder pieces in cold water to remove some of the yellow and brown pigments. Then pour boiling water over the washed madder pieces and leave them to steep for about 45 seconds. Then strain this liquid into a dye pot and repeat this process twice more. This forms the first “pour-off” dye bath. (See second photo below) NOTE: I usually make this “pour-off” dye bath because it helps to use up some of the yellow and brown pigments that might not have been washed out and that can make the red colour from the main dye bath too dull or brown. Then simmer the same madder dye pieces for about 30 minutes, strain off the dye solution and leave to cool slightly. Then add the fibres and leave them to steep for about 45 minutes to one hour. If necessary, the madder dye bath can be heated gently but keep it well below simmering point. NOTE: madder can safely be simmered to extract the dye colour but it is better to keep the temperature below simmering point after the fibres have been added, otherwise the colour may become too brown in tone. 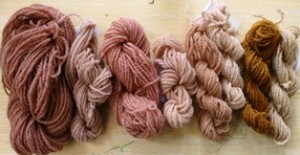 The same madder pieces can be simmered at least once more to make a further dye bath; indeed, the same madder pieces can often be re-used two or three times. So if we had had time to do this at the workshop, we could have doubled or even trebled the number of samples we achieved. As so often happens at workshops where time is limited, the colours achieved were not as deep and intense as I would have liked, although we did achieve a wide range of shades. Had we been able to allow the fibres to remain for longer in the dye bath, we would have had some much richer reds. This photo shows 24 wool samples. Sue (left) and I obviously enjoyed ourselves! I am very interested in the dyeing techniques of the past and recently I read Krista Vajanto’s dissertation on Dyes & Dyeing Methods in Late Iron Age Finland, http://urn.fi/URN:ISBN:978-951-51-1790-8, which contains some interesting details about dyes and possible methods for achieving reds (or reddish colours) in areas where madder and madder-related plants were not available. I corresponded with Krista before her dissertation was published and conducted some of my own tests, which I wrote about in my book A Heritage of Colour. Since then, I have been able to obtain some more information from reading Krista’s dissertation and I have started to experiment further. One method that would seem to have been used in the Iron Age in northern Europe is what Krista calls “the fermentation of tannins”. Apparently tannin-rich plant materials such as barks and the roots of tormentil (Potentilla erecta) will give red or rust colours if treated in wood ash water or a similar source of alkali. This is very similar to what I call the alkaline extraction method, which I use mainly with madder root and buckthorn bark. In my method, the barks or roots are soaked in wood ash water with no application of heat and the fibres are dyed in this alkaline solution, usually without application of heat or occasionally at a very low temperature. After some time, fermentation will begin and the dye solution will start to become neutral and then acidic. From my experiments using this method with madder root and buckthorn bark, I have found that if the pH becomes too acidic the red colours become more orange or rust in tone so, in order to obtain true reds, it is important to keep adding alkali to maintain a pH of at least 9. The method Krista used for her experiments with the tannin fermentation method differs somewhat from mine; she fermented the plant materials before adding the fibres, rather than adding the fibres to the wood ash water at the same time as the plant materials. In her dissertation Krista describes how, in her tests, the plant materials were steeped for four weeks in the wood ash water, which started off at about pH10, and then as the time passed the pH values decreased from alkaline to neutral and then to acidic and pH6 as the plant materials fermented. The fibres were then added to the dye liquid and steeped for two weeks at room temperature. So the main difference between the two methods is that Krista does not add the fibres to the dye solution until it has fermented and become acidic, whereas I add the fibres together with the dyestuff and maintain an alkaline pH while the fibres are steeping in the dye pot and I do not allow the solution to become acidic if I am aiming for reds. 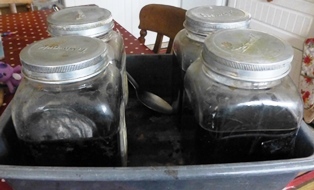 I half-filled the jars with wood ash water and then added the dye material and wool samples. The dye liquid became deep red after a day or so and I checked the pH of the solutions every day and added more alkali (wood ash water or soda ash) as necessary to maintain a pH of between 10 and 11. The samples were finally removed after two weeks. Although they appeared deep red/pink as they were removed from the dye pot, the red colour gradually disappeared as the samples were rinsed and washed, leaving much softer, paler shades. This was interesting, as the colour remains red when using this method with buckthorn bark and does not rinse out. Below is a photo of the colours achieved. (I would not describe any of the colours as “red”.) There are 2 skeins for each dye; the first skein in each pair is alum mordanted and the second skein is unmordanted. From left to right: birch bark, tormentil root, white willow bark, alder bark. I will now leave the dye solutions to become acidic and ferment before I add a further set of samples to each dye pot. Once my next tests are completed, I will write a further post on this topic. 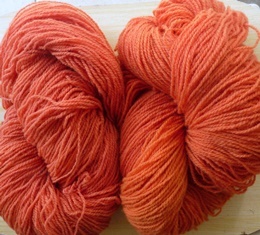 For interest, below is a photo of skeins dyed in an alkaline solution of buckthorn bark, following the same method as described in the tests above. 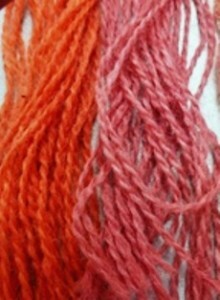 The dye bath was kept at around pH10 to pH11 and these skeins are definitely red.